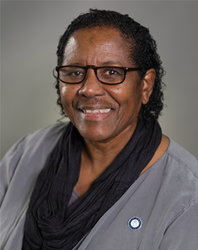 Dr. Gloria McNeal, Dean of National University’s School of Health and Human Services and a nationally recognized innovator who is changing how health care is taught and delivered, will be among the panelists at the 2016 Planetree International Conference on Patient-Centered Care in Chicago from Oct. 30 through Nov. 2. The conference is sponsored by Planetree, Inc., a nationally recognized nonprofit that partners with healthcare organizations around the world and which recently launched a collaboration with National University in developing a first-of-its-kind program to train a new generation of health professionals in exceptional patient-centered care. More than 1,000 healthcare professionals and educational leaders are taking part in the conference at the Downtown Chicago Marriott. The Clinic project, led by National University, is being implemented in partnership with the UCLA Geffen School of Medicine to provide residents with telehealth and in-person services in the south Los Angeles community of Watts. In coordination with various community groups, the Clinic manages the care of underserved residents by providing access to health care services for chronic diseases such diabetes, asthma, heart disease and high blood pressure, among other patient services. Site coordinators, who are based out of multiple Clinic community sites locations, schedule patient visits and assist with the use of medical equipment and virtual telehealth services being provided by Health Net Connect and iAssay that connect patients with the Clinic’s National University-Los Angeles campus central headquarters and medical staff at remote locations. On Nov. 1, Dr. McNeal will present at the Chicago conference, along with Planetree Senior Vice President Randall L. Carter and Dr. Ellen Kaye Gehrke, a Professor of Leadership and Integrative Healthcare at National University’s School of Health and Human Services, for a session titled Educating Future Healthcare Workers to Deliver Patient-Centered Care. This presentation will discuss the partnership between Planetree and National University’s School of Health and Human Services. Presenters will outline the organizational change process in which they are working together to restructure the school, curriculum, training and community healthcare institutional relationships. This is the first time Planetree is working with an accredited academic institution to design and implement an educational culture focused on the values and principles of patient-centered care.